With all the talk about the iPhone, it was almost easy to forget Apple’s product portfolio is one of the treasure chests of industry. They make great returns on the entire iPod line. They do a robust business with iTunes. And of course, there’s the computer line which has a devoted, loyal fan base and a solid profit margin. Today after the close of market, to the legions of Apple fans, and hungry investors anxious for a benchmark to measure performance of technology and consumer products, Apple announced their earnings for their fiscal third quarter. The numbers were strong, and buried in the guidance there were hints of new products to come. Sales of the iPhone, which arguably had more buzz and hype than any other consumer product launch of recent memory, were less than expected but hardly weak. 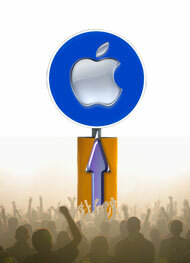 In the two of the quarter for which iPhone sales were counted, Apple sold 270k handsets. AT&T announced yesterday they activated 146k phones during the same period. Both sets of numbers were less than early projections suggested but they were a good start. Apple expects to sell more than a million phones by the end of its first full quarter of sales. In overall returns, it was an excellent quarter for Apple (as was last quarter). As Steve Jobs noted in a statement the company was “thrilled to report the highest June quarter revenue and profit in Apple’s history, along with the highest quarterly Mac sales ever." Apple reported net profits of $818m, or 92 cents a share, compared with $472 million, or 54 cents a share, for the same period a year ago. Those numbers handedly beat consensus analyst expectations and Apple’s previous guidance which had been for 66 cents. Revenues for the quarter were $5.41 billion, up from $4.37 billion a year ago. Gross margin for the quarter was extremely impressive at 36.9%, up from 30.3%. Some analysts believe that will be even higher as iPhone sales grow (iPhones have an estimated margin above 40% at their current price point). In products, Apple shipped 1.76 million Macs, up 33% over a year ago. IPod sales were up 21% to 9.82 million units. Geographically, international sales accounted for 40% of the quarter’s revenue. Given the strength of Apple’s numbers this quarter, guidance for the upcoming fourth quarter was shockingly low. Apple forecast revenue of $5.7 billion and earnings of only 65 cents a share (a dramatic decrease relative to this quarters 92c earnings). That number also came in well below expectations of 82 cents and prompted analysts to question whether Apple was being conservative or holding back information. In other words, the reduced guidance suggests in the 4th quarter Apple will likely replace a product line with something new. Such a move would be accompanied by an increase in marketing, inventory costs and loss of sales from an existing product line (and that would explain the lower earnings forecast). This could mean a new generation of iPods dramatically different from prior models is on its way, it could also mean a lower priced Nano replacing phone (as some have speculated), or it could be a shift in computing divisions. Apple is being tight lipped as usual. My crystal ball suggests it will relate to the Nano iPod product line which is do for an update. There is little solid to confirm that is the area up for change but at the least, Apple has noticeably been selling off refurbished and older Nano’s that were in inventory. That could be an indicator.